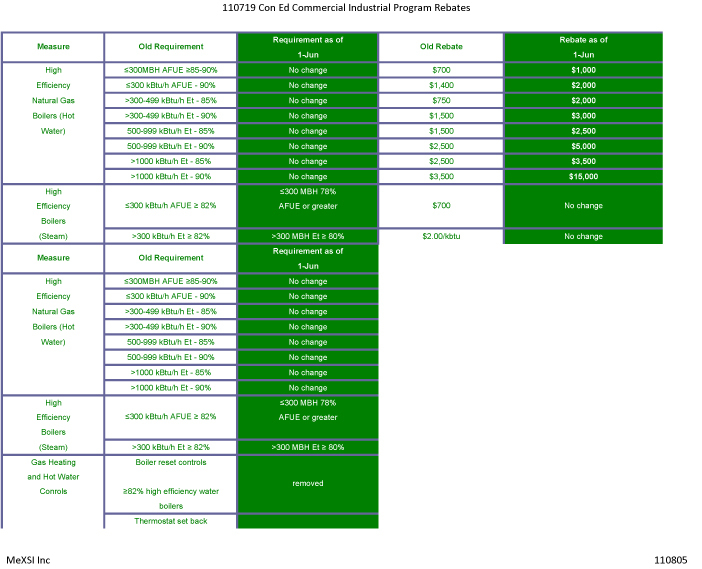 The spreadsheet above is a partial list of the Con Edison Commercial Industrial (C-I) rebate schedule for boilers. The alternate way to get (bigger) rebates is to submit a custom application authored by a Con Edison C-I Consultant, wherein the rebate is based on first-year’s natural gas and electrical savings. Con Edison reimburse the customer 50% of the study costs. Con Edison will also rebate energy improvements at WALLS AND ROOFS, including installation of insulation above ASHRAE 90.1 requirements, something NYSERDA will not do. The program managers at Lockheed Martin are a pleasure to work with, as are the folks at Con Ed. This entry was posted on August 5, 2011 at 7:50 pm and is filed under Energy. You can follow any responses to this entry through the RSS 2.0 feed. You can leave a response, or trackback from your own site.